Home / Blog / Why does New Starlight Cruise become superior on Halong Bay? Why does New Starlight Cruise become superior on Halong Bay? Since its grand launch, Starlight Cruise has now become one of the most perfect choices for luxury cruises on Halong Bay. The new luxury cruise is rising to be a superior one for luxury travelers among a large number of crews on this charming well-known bay. 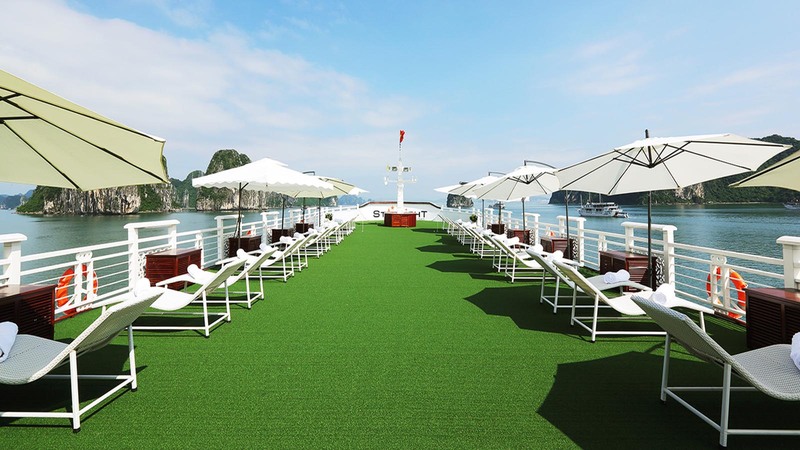 With total length of 58 meters, the only one double-shelled Starlight Cruise is one of the biggest and the safest among 5 star cruises on Halong Bay. 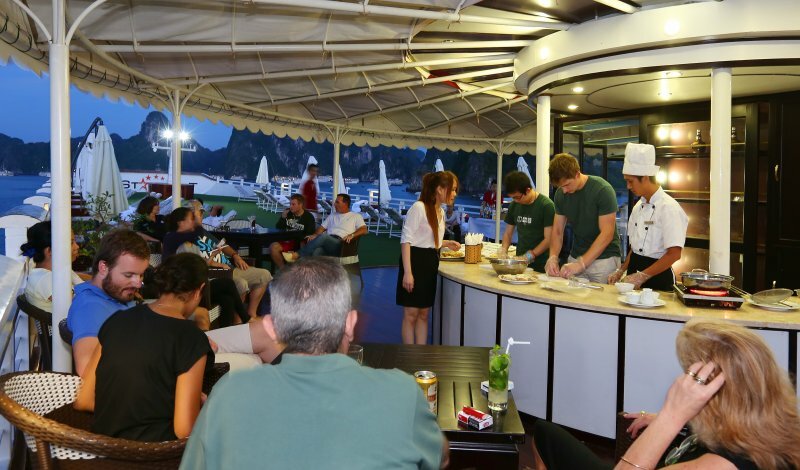 Offering the most luxurious service on the world heritage of Halong Bay is a bold idea of a fancy cruise. Even though you are informed about its factsheet before, you must be really impressed to see how huge it is. Actually extraordinarily huge, this cruise will amaze you right at the first sight. According to them, tourists will still spend much of their time in their own cabins, where they totally relax during their trips, no matter how luxurious the shared places are; so, Starlight has huge cabins (50 meters square for Suites and 22 meters square for Deluxe & Executive) while some of other cruises do not use enough area for cabins. Thus, they ensure each cabin to be large and fully-equipped. Moreover, there is a small simulated golf course for entertaining on board on the large top deck of the Starlight. All travelers can find themselves a lazy chair to be delighted by the spectacular bay. 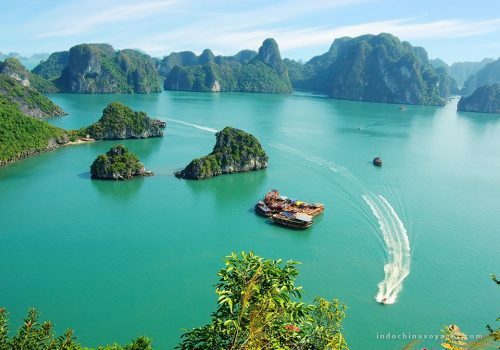 Can you imagine how amazing it is when being in a luxury floating hotel on Halong Bay? 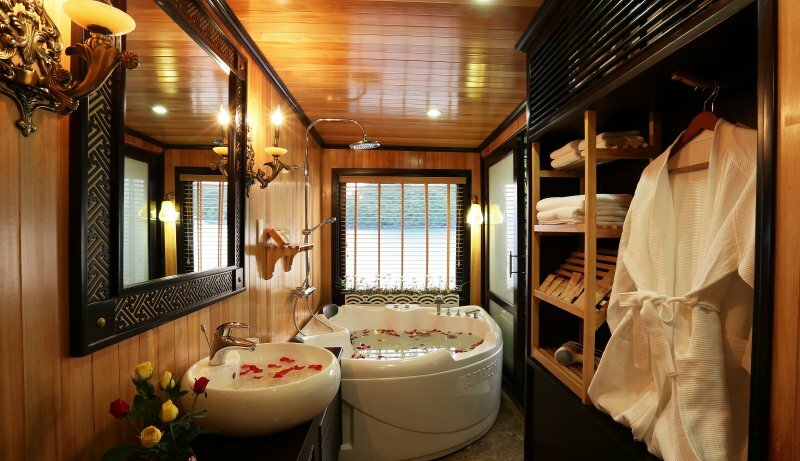 In your own cabin, you can definitely indulge yourself in your large bathroom and enjoy relaxation. If tiny bathroom in some city hotels might make you feel as if you would easily get stuck in, then the regal bathroom of Starlight cruise will make you satisfied. There is a bathtub in each cabin in the boat, which is really good news for all bathtub lovers. Admire the magnificent bay from the big window of glass next to the bathtub while enjoying the relaxed feeling of sinking your body in the fragrance water in the charming bathroom is exceptional experience. 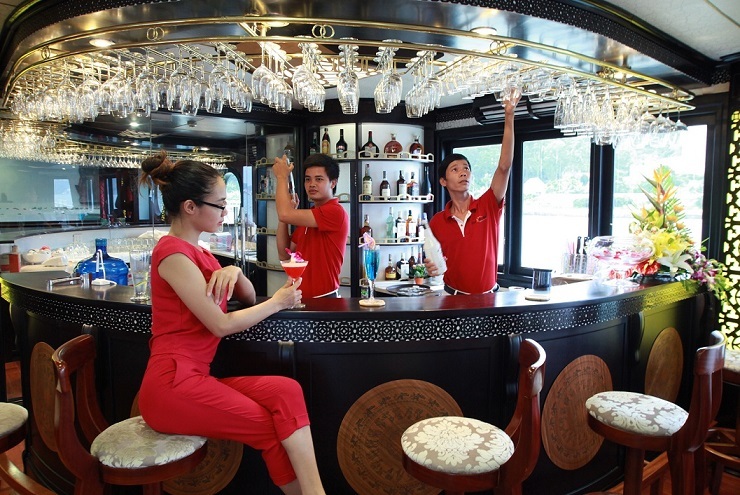 Made by metal, but Starlight is not only a traditional wooden junk like most of Halong Bay’s boats, the cruise also provides you with cozy and awesome atmosphere in your luxury tours in Halong Bay. Inside the boat are some high-end materials and well-furnished wooden materials in deep and warm tone of colors creating a cozy feeling, particularly in the evening. Since the designers maximize traditional charm as well as take advantage of western modernity, the Starlight is a perfect harmony of oriental attraction and modern beauty. The exquisite food offered on board will make all diners satisfied. In order to keep the elegant space of quiet dinners and the chic atmosphere, on board, there is no buffet. There, all of three meals: breakfast, lunch and dinner are offered by menu. You will easily enjoy both exquisite western cuisine and unique Vietnamese flavors at the same time with 5 dishes for lunch and 6 dishes for dinner. In the evening, during the warm dinner, you will enjoy a really cozy and charming atmosphere created by the female staffs’ costume of the traditional Ao Dai, the gorgeous and elegant costume of Vietnamese women. While having meals on board, diners will also admire the spectacular bay of mystic formation of limestone passing by the restaurant’s huge glass windows. Really huge, the glass window stretches from the top to the bottom of the lounge and maximizes the view to the stunning bay.